Developer: Beam Software Pty., Ltd. 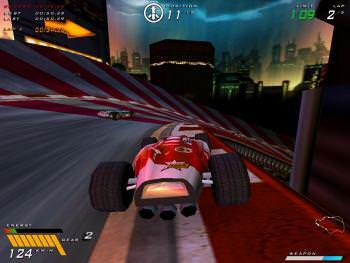 Developer / company: Beam Software Pty., Ltd.
Dethkarz is a fast, arcade-like racing game with futuristic cars and tracks. All courses are set high up in the air with slopes sides and gaps, and there is no invisible wall, so missing a corner leads to a deep fall where the car is picked up by an aircraft and placed back on the road. There are four main tracks (Metro City, Grand Keys, The Pole, and Red Planet) with three variations based on length, and three main game modes: Time Trial (with ghosts for the best times), Arcade and Championship. Multiplayer games are also supported. If you need more information please contact the developers of Dethkarz (Beam Software Pty., Ltd.), or check out their product website.